Last week I posted, “Confessions of a Former Worship Leader,” which garnered quite a bit of attention. The post deserved an immediate follow up though it seemed best to let it simmer, both in my brain and yours. The main argument of the blog was that musical worship in church has gotten a bit out of hand. And while I don’t wish to see an end to musicianship in the church (by any means), I do think it’s healthy to deconstruct what we do, examine it and question. The sacredness of worship is beautiful and timeless; the traditions we’ve built are what’s worth questioning. In the days since that post, I’ve had a couple great conversations regarding church and the program—some I agree with, some I don’t. There seems to be a growing sentiment of disdain for the modern, local church. You could almost call it distrust. In fewer words, the growing sentiment is this: let’s kill the program. The program (church program, that is) is, arguably, built to shuffle many people in and out of a building on Sunday. The before statement removes any spiritual aspect from the motivations of the elders and pastors, I understand that. But this is the perspective of people like me who just don’t relate to a big show on Sunday. To us, church is, and should be, nothing more than a gathering of believers. We believe that Church can happen anytime throughout the week, and the existence of a stage feels counterintuitive to Christ’s message. To be honest, I’ve grown past my contempt. Big church isn’t something I feel we should kill. I still have struggles, yes, but I’ve come to respect big church for who they serve and all the good that they do. Just because I don’t personally relate to the show on Sunday, doesn’t mean other people can’t. In fact, many, many people do. This was a hard realization to make. Sometimes, I feel the criticism take over. In these cases, I’m sinning. If we’re not careful, the distrust in our church may become just another empty tradition we wrap ourselves up in. This is why every believer needs to be in fellowship. Not in a big church, not in a little church, just in church. Other believers keep us grounded. When we have someone to bounce ideas off of, instead of the padded walls in our brain, we are given feedback and advice. Sometimes, just saying something out loud relieves the tension. 1. How do we mend the growing sentiment of distrust between believers and the church? 2. Will there always be a gap between anti-program and pro-program believers? Is this an issue we should even try to solve in this world? 3. By respecting the program, would those in church be more willing to respect the, I hesitate to say it, “organic model”? 4. 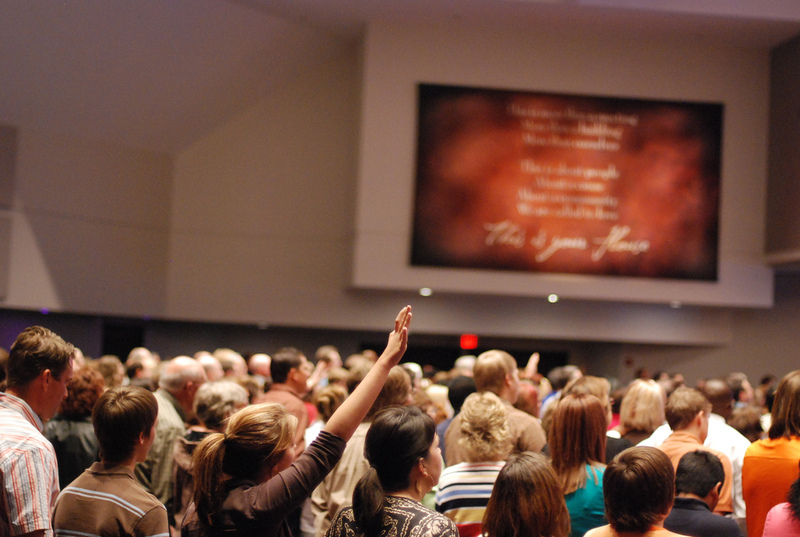 Can corporate worship exist outside of physical church walls? 5. If we’re not involved in church, do we have a right to criticize it? Kevin, what is your meaning by the phrase “organic approach”? I suppose I mean, possibly, a more home-based approach. I understand that home church isn’t for everybody. It seems people on both sides think the “other way” is the wrong way. This sentiment should indeed be corrected, I believe. What do you think? I think people should do what they believe God is leading them toward. It really is not my concern nor even my desire to crash the party of those who like an organic approach vs. programmatic approach to their worship, and vice versa. My concern arises where one is trying to pit one approach against the other based on the notion that ONLY one of them is right. In this case, this is where relative choice is an idea I think is allowed because there is no absolute rule on this issue, save following the biblical and historical patterns of worship laid down by the line of progenitors of the faith; having worship that is biblical. Moreover, to further my latter point on embracing the diversity of approaches to worship, we as Christians should know better. God himself is the blueprint of university, that is the unity of diverse ways for a univocal cause and purpose He himself has made plain to us–to worship Him in the beauty of His holiness. He being three in Himself is also, they and He. And the testimony of his universal nature is written in his creation (i.e. space, time, and matter). So out of one has come creativity and expression ever so seemingly spontaneous and unique and lovingly beautiful. Why on earth then, would we limit one another on the administration and execution of methods for worship? If it is God’s leading, it glorifies Him, and bears fruit, by equipping the body and making more disciples, then God forbid it that I should stand in His way and face rebuke. I know when to recognize the hand of God acting in a matter and so to honor the authorization given to a ministry and thus being obedient to the Spirit. That’s all I got right now. It took me a while to have an answer. I’m late to the party it seems – however… I meet with a small group of believers (outside the church walls and outside a church small group” program”. It IS church to us. We’re all connected through a shared past but some of the people go to different churches on Sunday. We worship together in song pray for one another and learn together. It IS church as I said. So just saying yah, church does happen outside of church wall. Great point. Just like David, our elders and leaders will always sin. This doesn’t mean we need to blindly follow them, but I believe we do need to speak and have our voices be heard. Thanks for the addition! First, the church needs both programs and a place to meet. Whether that’s a coffee shop, an auditorium, a high school or whatever it is, there needs to be a place where the people can gather (in the OT it was a tabernacle and then a temple, and then when the church started growing they had houses). The programs as well are necessary so people can know where they are, BUT the end goal is not the programs or the building but the people of God gathered together. Second, there is a growing awareness of the way the world views a majority of Christians (anti-gay bigots) and an increasing awareness of how to interact with the world in an understanding and loving way. Yet my concern is that people give too much in to the world and refuse to take a stand on anything. Jesus said the world will hate us (John 15:18) yet so many Christians I know try so hard to be accepted by the world. Third, there’s a few books that have greatly influenced my thinking on this. First is ‘The Trellis and the Vine’ by Colin Marshall and Tony Payne. Second is a number of things Mark Dever has written, but specifically ‘What Is a Healthy Church Member?’ Finally, ‘Why We Love the Church’ by Kevin DeYoung and Ted Kluck. I’d love to get your thoughts on these books! Thanks for your interaction! Mike, thank you so much for your thoughts. I’m very grateful to hear your opinion on the matter, as I’ve really enjoyed reading your blog. Your second point is something I’ve struggled with. Jesus says the world will know us by our love, but also says the world will hate us. I feel that real love is something the world will hate, since it can only come from God. Thank you for your book suggestions! I’ve been making a list of all the great recommendations I’ve been getting on here. I’ve really struggled with that tension in my life as well. How can we show our love while still being hated by the world? One of the things I’ve come to realize is that the calls to love in the Bible are not to love the things in the world, but to “love one another” (John 13:35, and 1 John 4:7-21). I really like what you said about real love being something the world hates-it cannot know what real love is apart from the work of God in their lives. I really liked both of your posts. I think you are tapping into something bigger than worship though. You are getting into a conversation that calls us to re-imagine the way we are church. I think the issue at the bottom of what you are expressing here is the nonconformity and tiredness with the organized christian religion, which is a characteristic of our generation. In addition, the church as an institution has hurt many people and worship has been used as a manipulation mean in many cases. I think, however, that there is something that we all need and that is, a more holistic, organic approach to the way we understand the church. We should understand and be the church in a way that is transformative and subversive. Some times, I wonder if the church was ever meant to be something as big as it is today. Anyway, the church and “worship” are what they are today. And, just to finish, I think that worship is a space where we need all of the streams of Christian spirituality to inform and transform each other. WOW! What a thoughtful and well-written comment. A more holistic, organic approach is something I’ve personally been craving. I see this method is not for everyone and big church helps people too. I still fear, however, the consequences of mega-church (or medium to big church) in regards of teaching a “mega-mindset” in the way we live out our faith. Thank you for the encouragement. You raise some very important questions to ponder. I will attempt to address only one at this point – the issue of trust. One of the great ironies I find in modern culture is how so many particularly in my generation (40s) are divesting themselves (time, talent, money) from the program of the church yet flocking in droves to invest themselves in capitalist ventures (Starbucks, Amazon, Apple) that pleasant perks to be consumed. Thanks for these thoughtful posts. Great thoughts, as usual. You’ve brought up a key issue here. Church is not what you take out, but what you put in. In the past, I’ve wondered if the “program” only exists because of the lack of involvement on the Body’s part. This could be a double edged sword, since people may be less inclined to invest since there is a program. In our modern age, only extreme counter-culturalists (like the Amish and conservative Mennonites) can achieve the level of commitment required for a more fully organic model of the Body. I do think a healthy modern church will draw on the gifts of time and talent from its members, but in order to function will also need to fund a program of some kind (including “professional pastors”). Had a “V8” moment, just saw you had a follow up article. Good stuff! Where I am at, I’m currently exploring a more ‘organic’ approach to ‘church’. I’m taking the line of thinking that since I am part of The Church, which is His Body, what does it look like in the every day ebb and flow of life instead of Mon, Wed, Fri & Sunday. Hopefully that made sense. I think that they’re more useful in big groups – the kind of clear organisation is kind of necessesary, but we shouldn’t assume that small groups need programmes as much. I remember being part of a very small church of about 30 people and someone came along and starting talking about starting a youth ministry and a childrens ministry and I think even a sport ministry, and I just thought – we don’t need it, we can disciple our kids and youth organically. Programmes in small groups just burn people out. Andrew, I have not read “Total Church.” It sounds like it’s right up my alley. Thanks for the recommendation! Personally, I think organization (and leadership) is fine. Every group of people generally need some sort of leader, whether it is conscious or subconscious. I think leadership can work in small group formats. I do believe, however, leadership can be more flexible and willing to bend to the needs of the people in smaller format. Thanks for your comment, let’s stay in touch! I’m loving this dialogue you are having. I have saids for a long time that I don’t like “organized” religion – we focus too much on the programs and forget the real reason we are here in the first place. As the wife of a former Music Minister I can so relate to what you are talking about. I started hiding out in the library during worship and keeping my distance because I got so tired of all the “discussion” about what we should or shouldn’t do in worship. My husband just graduated and is now looking at church jobs again. I really don’t want him working for a church, so I’m having to do a lot of soul searching about the future and what that might mean. Right now we are attending a really, really small church that my father attends. There are no large programs or this is the way we’ve always done it mentality (don’t even get me started on that one). They have one business meeting a year and it last less than an hour. Everyone shows up to worship together and if there is a need it is met, otherwise there is not a lot of pre-planning as far as how it’s done. It is rather refreshing to attend a church without an agenda other than to glorify God and reach out to others. As true Christians, keeping an open mind is extremely important if we are to love, live and give as Christ did. I adore your mind and blog for their thoughtfulness, quirk, and beauty – but mostly because the topics presented (alone and in conjunction with others comments) introduce and encourage us to consider view points besides our own. There’s always room to learn/grow, especially in relation to God and understanding. Why thank you! It’s nice to mee you. So long as the central message of “Saved by Grace through faith in Christ Jesus ALONE” is reflected in any and all teaching, singing, praying etc. then that’s great! My problem with some of the more excitable ‘worship’ is that while it is wonderful at the time engaging with the Lord in praise and thanks-giving, if that is the only soul / mind-renewal there is then within hours we will be hungry again. I love all the leaping about and throwing hands in the air and I love teaching on all aspects of the Bible. I’ve learned the hard way though that this is not a quick fix for the soul but an understanding that we are saved by grace in our born again spirit and yet the soul is unchanged without thorough meditation on who we are in Christ Jesus through the teaching of the Word. It truly hurts to see that some people on your worship team that take another member worship in vain. I believe that everyone’s spirit can be a little different than another’s. Some can be a little more stronger. And this doesn’t mean God can not and is not useing them. Yes I been criticized for this and habe left the church , but it still hasn’t stopped me from loving to worship God at home. My husband (who is the payed minister of music there at the church) is still there continues music there comes home fustrated saying how ” the music department is not going well and that some people think praise and worship is just a entertainment” Yet you (me as his wife ) won’t be my back bone and help me. I keep trying to remind him that I was there and his childhood friends on the team (who grew up with him in this same church) are the same people who didn’t want me on the team (because i was too hyped with praising God). Now Iam home every sunday still praying, worshipping and honorring God by myself. Yes I was hurt by the church and my husband and I still believe that Praise and Worship to God is a act that comes from within Not just practicing and singing a song. What shall I do ? I ask because it’s even destroing our marriage? It truly hurts to see that some people on your worship team that take another member worship in vain. I believe that everyone’s spirit can be a little different than another’s. Some can be a little more stronger. And this doesn’t mean God can not and is not useing them. Yes I been criticized for this and habe left the church , but it still hasn’t stopped me from loving to worship God at home. My husband (who is the payed minister of music there at the church) is still there continues music there comes home fustrated saying how ” the music department is not going well and that some people think praise and worship is just a entertainment” Yet you (me as his wife ) won’t be my back bone and help me. I keep trying to remind him that I was there and his childhood friends on the team (who grew up with him in this same church) are the same people who didn’t want me on the team (because i was too hyped with praising God). Now Iam home every sunday still praying, worshipping and honorring God by myself. Yes I was hurt by the church and I still believe that Praise and Worship to God is a act that comes from within Not just practicing and singing a song. The question you should be asking yourself is, does God want me on the team and in the trenches.I have been a worship leader for 30 years and I can tell you from experience none of us are on the same spiritual level as everyone else on a daily basis. If we are truly worshiping our God we shouldn’t even notice what is going on around us. God has given you your marriage and your first vocation is to your husband as it is for him to you. We don’t always like the things we need or should do but I can tell you there are graces and blessing that come from serving God even when we don’t want to, don’t rob yourself of the graces and blessing God has for you by refusing to support your husband and his ministry. One last thing never bring up the past, it is over with and can not be changed. What you do together from this moment on is what God is interested in. For question #5, what type of criticism are you asking about, criticism with feeling or criticism with no feeling? I can appreciate your comments here. Came searching after being literally thrown away by a church after 3 years of leading the worship service. 2.5 years of renting a place, dragging in sound equipment each week, not having rehearsals or a place for them, doing quick run-thru on Sunday just before service, mostly karaoke style music, since my keyboard player was out for most of a year with double knee replacement…no other instruments besides my trumpet and wife’s French horn, when she wasn’t the lead singer. Anyhow, several weeks prior to first Sunday in brand new church I was benched, then the sunday before was told by pastor that the board has been talking for 6 months that I “don’t have the skill set” of a worship leader! First Sunday in new church, I wasn’t even asked to play offertory or pre-service…My one close friend on the board says at no time did they discuss the “skills” of a worship leader…apparently it’s just not me. This church has had an entire band up and quit on them all at one time in the past! Seems pastor does not have good mgmt. or people skills. It wasn’t about the music style, whether contemporary or hymn. I wasn’t supposed to say much at all between songs, and the guy preaches for 45 minutes minimum but shortened music to just 2 short songs to shorten service time. They threw me away without having even a possible replacement–nobody who wants to lead–in the church. I doubt very much that I’ll ever volunteer to lead anywhere again…hopefully can still play the horn for some church. About to leave this one in the rearview mirror. I know how u feel, i was REPLACED by another member in our worship team, and was informed this in a very impersonal email. Not becoz i wasnt any good or becoz of faith issues or anything – ” they wanted to start bringing the youth in”! I was shocked and horrified that they could just toss someone aside like that after a long time of faithful service. It stinks. Where s the love in that? I was VERY hurt and still am and angry. Being in the worship team fed me spiritually and i miss that a lot. But it s over and i dont think i ll ever play in a church again, unless i get a heartfelt apology. The fact that people get hurt by others in churches is disgusting, i have non christian friends who are mortified by the way i was treated. But this isnt over, my initial reaction was to leave the church, but i ve decided i m going to fight back and go to the elders about this, – these are the very reasons why so many congregations never get beyond the 200 mark in members. I encourage anyone who s been hurt in church to take action, if u leave the devil wins….. I appreciate the thoughtful comments I have read. I am part of a moderate size (800 worshiping) congregation that I love. I have been a member for over 20 yrs. My gifting is more in the area of prayer. That is why I am concerned about the direction of our worship. It is becoming too much about the “experience”. We have 3 services–one traditional and 2 contemporary. I prefer the traditional. This past Sunday, my 2 adult daughters left the worship center because the music was so loud. This breaks my heart. I serve on the Worship Committee and feel a responsibility to address these issues. I feel the sermons at our services are very grounded in Scripture but weak on prayer and overzealous with the music. (Do we have to fill every ounce of available space with “soundtrack music” because we are afraid to be still in the Lord’s presence? I am praying for guidance. How do I make a case to our pastors/Worship committee/leadership to tone it down and refocus? Worship isn’t worship because you give lipservice to it being about Jesus, then move into the “experience”, making the music your idol. I can definitely relate to your comments. I am currently a Pastor/Worship Leader. Worship should not be confined inside four walls. I was just thinking about that like yesterday! Why do we have a stage? I don’t know, and being part of a worship team there definitely is pressure and it can be very frustrating. I feel like just a different set up would be good, for me at least. Just a focus on God but also on being brothers and sisters in Christ. I’m sure this opinion is not a universal one, but that’s the beauty of it, diversity is a very beautiful thing! And I do love experiencing how other churches or people worship!